PITTSBURGH (June 25, 2014) – Part-time faculty members at downtown Pittsburgh’s Point Park University have voted to join the Adjunct Faculty Association of the United Steelworkers (AFA-USW). The group filed a petition with the National Labor Relations Board (NLRB) in April to hold a mail ballot election. A total of 314 part-time Point Park instructors were eligible to vote, and the ballots were counted this morning at the NLRB’s downtown offices. Among the issues the instructors hope to address are: a decade of wage stagnation as well as their lack of benefits, job security, office space and other tools needed to provide the quality education that Point Park students deserve. Point Park instructor Sharon Brady said the vote was a victory for the university’s teachers and their students. “I am looking forward to working with the administration, with the support of the USW, to enhance both the adjuncts’ experience and their effectiveness for the students they serve,” said Brady, who has taught theater arts at the college for 13 years. The Point Park instructors are the second group of adjuncts to join the AFA-USW. Instructors at Pittsburgh’s Duquesne University voted overwhelmingly in the spring of 2012 to join the AFA-USW, and the university at first agreed to abide by the election results before quickly reversing that decision, claiming a religious exemption. June 24, 2014 – Those skeptical of renewable energy as a viable power source often note that the wind doesn’t always blow nor does the sun always shine. But advancements in battery technology are helping keep energy flowing on those dark, windless days. “It’s happening at a record pace,” said Lisa Salley, vice president and general manager of energy and power technologies at Underwriter Laboratories, a Northbrook, Ill.-based independent safety consulting and certification organization. The goal is to increase the usability of renewable energy, which currently accounts for 21 percent of all electricity generated worldwide but just 11 percent of consumption, according to the Energy Information Administration. “One of the areas that’s been neglected in the past has been the storage component of renewable energy sources, and that includes wind and solar, of course,” said Tom Granville, CEO of Axion Power International. That, however, is changing. Power, chemical and material science companies, locally and elsewhere, are investing heavily in battery technology. Some are improving existing technology while others are developing new chemistry to create entirely new battery structures. 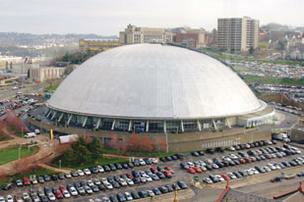 The site of the former Civic Arena in the lower Hill District of Pittsburgh. June 12, 2014 – It wasn’t written in as part of the agenda for the Pittsburgh Zoning Board of Adjustment meeting. But a court-required status update by the Sports & Exhibition Authority on the progress of the former arena site redevelopment by the Pittsburgh Penguins in the Lower Hill District came with a call by community groups for more affordable housing and for funding applications to include more of the neighborhood. The leadership of the Hill Community Development Corp., the Hill Consensus Group and One Pittsburgh used what was otherwise a routine update on the process of applying for grants and building roads and sewer systems into a call for the Pittsburgh Penguins to meet more of their demands and concerns. Carl Redwood, a community organizer for the Hill District Consensus Group, criticized an established variance approved by the ZBA for the Pittsburgh Penguins that allows the team to generate private revenue from the publicly owned arena site while the SEA applies for state and federal grants and loans to subsidize development plans for the 28 acre property. In reiterating a call for a $1 per car fund from the parking revenue to invest in community improvements, Redwood expressed a concern in the city’s African American community that new development will result in displacing established residents who lack the income to be included in them. WE know the science is unequivocal. The world’s temperature is rising, current trends will lead us to a 4°C average increase or more in this century and without urgent, ambitious action we will face irreversible changes in our climate. The ITUC wants the world’s governments to agree on climate action and give us a fighting chance to limit the temperature rise to 2 degrees or less. Climate-related catastrophes such as cyclones, floods, drought, fires, melting glaciers, season changes and more are increasing and hurting working people now. Their impacts will only become stronger within 15 years – this will destroy more communities and jobs. Science tells us we need to urgently stabilise carbon emissions at 44 GigaTonnes.Business as usual gets us to 59 GigaTonnes by 2020. It doesn’t add up. All our economic sectors must change. We demand to be part of the industrial transformation with universal access to breakthrough technologies that will make our industries and our jobs sustainable for workers everywhere. We have played our role in UN negotiations and fought and won commitments to ‘Just Transition’. Now we want to see the transition happen on the ground, including through investment in new green jobs, skills, income protection and other necessary measures implemented everywhere, with funding for the poorest and most vulnerable of nations. Climate change is a trade union issue – it threatens everything the labour movement stands for: fairness, social justice and decent work. We need a global agreement and national actions to transform our industries, create jobs and support our people. From the UN Climate Change talks in Lima 2014 – to Paris in 2015 we are building the movement for an ambitious global agreement. In fall 1985, during the last days of the Union Switch & Signal complex in Swissvale, I was chief steward of local 610 of the United Electrical, Radio and Machine Workers of America. Most days, after some hours as a laborer in the machine shop, I made a tour of the plant, listening to anxious workers, meeting with management over grievances and monitoring the dismantlement of the plant. As I walked one day across the 40-acre site — between the five-story electronics assembly and shipping building and the machine shop and final assembly area for switches, crossing gates and railway signals — a tough millwright steward pulled alongside me in his maintenance vehicle. “I thought you might be interested in this,” he said, indicating a box filled mostly with company magazines from the 1920s. On top of the stash was a plant manager’s photo album. Though the photos were not annotated, some of what they depicted became clear as I uncovered the chain of events. There were photos of a mass march outside the gates, of workers in large groups walking out of the plant and of strikers in a nearby ballfield behind St. Anselm Church. There were photos taken inside the plant of hundreds of non-strikers being fed. It was evidence of a dramatic labor conflict largely lost to labor and Pittsburgh history. 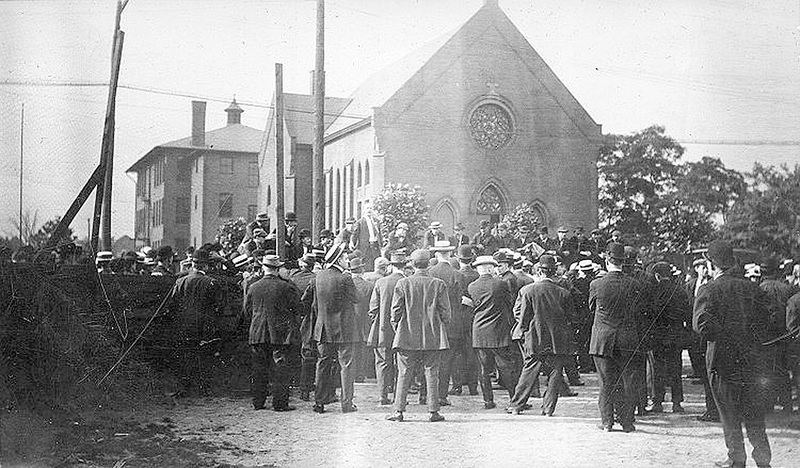 In June 1914, about 12,000 Westinghouse Electric workers went on strike. More than 1,000 workers from Union Switch & Signal joined them in a solidarity strike. The workers organized themselves into an independent industrial union in which women played a key role in the ranks and leadership. For over a month, the strike fashioned an impressive non-violent resistance to one of the giants of the new corporate age. The strike illustrates the reaction of workers to the practices of scientific management in modern industry and raises issues of worker participation in the workplace that remain relevant today. Union Switch & Signal — the property today is Edgewood Towne Centre — was the second of the three core facilities on which the far-flung Westinghouse empire was built. George Westinghouse’s original business was Westinghouse Air Brake Co., located in the Strip District and later in Wilmerding. His innovative braking systems, which used compressed air to stop long strings of railcars, enabled trains to travel much faster, and with heavier loads and more cars, than before. But with the increased speed and complexity of rail operations came the need for a panoply of switches, signals, crossing gates and electronic control systems. At a plant at Penn Avenue and Garrison Alley, Downtown, Westinghouse began to apply the theoretical work on alternating current pioneered by Serbo-Croatian genius Nikola Tesla. These experiments led in the 1890s to the construction of a massive complex containing the electric, machine and meter works in East Pittsburgh and Turtle Creek (later consolidated as Westinghouse Electric or “the Electric”) and the switch plant (“the Switch”) in Edgewood and Swissvale. The area became known as the “Electric Valley.” From Solitude, his mansion in Homewood, Westinghouse could access his air brake, electric and switch complexes via Pennsylvania Railroad. Westinghouse was a down-to-earth man who had empathy and respect for skilled craftsmen. Unlike the overwhelmingly foreign workers who toiled 12 or more hours a day, seven days a week, at the neighboring Edgar Thomson Works of U.S. Steel, the Westinghouse force worked 10 hours a day, six days a week, until the company scaled back to a half-day on Saturday. Featuring indoor plumbing, Westinghouse housing also was significantly above steel-mill standards. There were hopes that Westinghouse might welcome organized labor, but in a 1903 letter to Samuel Gompers, president of the American Federation of Labor, he declined to unionize the work force voluntarily. He said “the fair and honorable treatment of employees” — including the partial work day on Saturday, described as unique in the country; the standard 54-hour week; and an openness to settling grievances — precluded the need for outside representation. He noted that he had refused to join anti-union organizations of employers and offered to work with Gompers to assure a “comprehensive and beneficial system” for retirement security. Most surprising, he shared Gompers’ letter — and his reply — with all employees in his plants. During the 1907 economic crisis, however, Westinghouse, who regularly plowed profits back into expanded production facilities, was forced to relinquish control of the Electric to a consortium of Pittsburgh and New York bankers that included the Mellons. He died three months before labor strife broke out in June 1914. To reduce the autonomy of skilled machinists and mechanics, new ownership began to impose a rigorous version of Frederick Taylor’s scientific management system. Time and motion studies and piecework systems were calibrated to drive production and control every aspect of worker effort. Health and safety concerns of Westinghouse workers were reported by Elizabeth Beardsley Butler in her “Women and the Trades” volume of the 1909 Pittsburgh Survey. Aside from the hated piecework system, which pushed the women to the limits of their endurance, the central issues she cited concerned poor ventilation for female core molders in the foundry, mica dust exposure for insulators and copper dust and bad air for hundreds of women who wound coils for electric motors. In early 1914, tensions bubbled to the surface at the Electric. Layoffs and reductions in hours led to a large street protest and then to organization of the Allegheny Congenial Industrial Union. Asserting that Pittsburgh had become “a synonym of slavery” among the workers of America and that “of all the working hells in this district, Westinghouse is recognized as the chief penitentiary,” the ACIU called on workers in the Pittsburgh region to raise the flag of industrial revolt. Women came to be well represented among the leadership, a fact that underscored the aim of the new industrial union to present a non-violent, disciplined and patriotic front to the public. Demands for progressive political reform were increasing. The Socialist Party, led by railroad union man Eugene Debs, had out-polled the two major parties in the Turtle Creek Valley in 1910 and 1912. While socialists and two factions of the Industrial Workers of the World were active among workers here, the ACIU was a unique, homegrown entity. Record heat and polluted air triggered a walkout June 3 by 23 men in the Electric’s machine shop. After an unsuccessful meeting with management the following day, a mass meeting called for a strike on June 5. Women, who numbered 1,200 of the initial 7,000 strikers, were noted for their enthusiasm; 1,000 of them became the core of the picket line and the leaders of marches. Numerous attempts to import guards and replacement workers at the Electric were thwarted by pickets blocking egress from trains. The appearance of armed guards at the Electric prompted a June 11 meeting of ACIU Local 2 at the Switch and a vote by workers there to strike in solidarity with their East Pittsburgh and Turtle Creek counterparts. Buoyed by the action of the Switch workers, the Electric’s strikers decided to march to Swissvale. About 5,000 strikers with bagpipe bands and a caravan of automobiles arrived at noon June 12, a beautiful sunny day. Newspapers estimated that three-quarters of the Switch shop men walked out in support of the Electric. Unlike the more hard-line Electric management, the Switch management addressed workers’ grievances. They made some concessions on premium pay, for example, and agreed to meet with committees of workers from each department to address problems. On June 27, the Switch agreed to return to work. Two days later, armed gunmen reappeared at the Electric and began hurling insults at strikers. This provocation had the intended effect; some strikers roughed up two company men on motorbikes and then the East Pittsburgh police chief when he tried to intervene. These events provided the rationale for the Allegheny County sheriff to summon the state constabulary. The same day, 30 mounted troopers entered East Pittsburgh. “As the dust-covered troopers rode two abreast along Braddock Avenue, a flag-waving striker, tears flowing down her cheeks, sprang out in front of the horses. At a sharp command, the horses were reined in. The girl cried out, “Oh, have you come here to shoot us down? The strike began to weaken by week’s end. On July 6, the company began hiring replacement workers in Cleveland, Detroit and Philadelphia. When the final several thousand strikers returned to work July 13, the company sent many of them home. Few foresaw that a horrific European war would break out in weeks. Indeed, in Pittsburgh newspapers, the entry of troopers into the Turtle Creek Valley had overshadowed the assassination of an Austrian duke by an anarchist in a Balkan backwater named Sarajevo. The Westinghouse Strike of 1914 was a tragedy in Pittsburgh labor history because it marked a moment when a more flexible and intelligent management philosophy might have met organized skilled workers halfway and created an alternative to the class-war methodology that has dominated America labor relations. If Andrew Carnegie had lived up to his own pronouncements on labor rights in 1892, if George Westinghouse had been alive to moderate a settlement in 1914, perhaps a more collaborative industrial labor relations system might have evolved. Instead, the issues of the 1914 walkout remained unresolved, and all thoughts of congeniality disappeared. 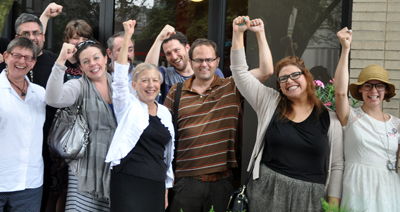 Two years later, another, better-known strike erupted at the Electric. This one was militant, with three killed and 30 wounded. Charles McCollester (charlie.mccollester@gmail.com) is president of the Battle of Homestead Foundation and a retired professor and director of the Pennsylvania Center for the Study of Labor Relations at Indiana University of Pennsylvania. He lives in Mount Washington.